Thai Airways International has become the eighth operator of the A350 XWB, following the delivery today of the first of 12 aircraft set to join the carrier’s fleet. The aircraft is being operated on lease from US-based CIT. 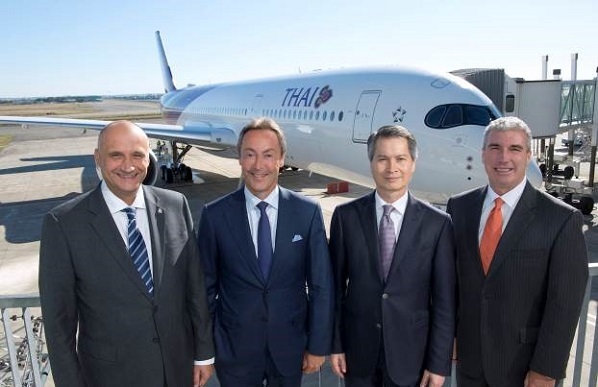 Altogether Thai has acquired 12 Airbus A350 XWBs. Four of these are being purchased directly from Airbus, with the other eight aircraft being acquired under lease agreements. The spaciousness, quietness, beautiful interior and mood lighting in the cabin contribute to superior levels of comfort and well-being, setting new standards in terms of flight experience for all passengers.